Answer: You are correct. 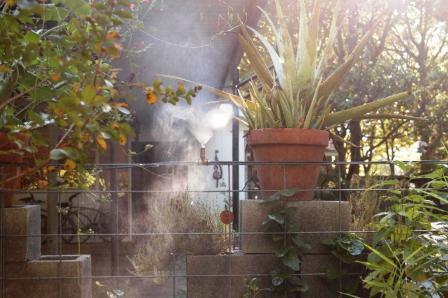 The destruction of the natural life in the garden is just one, but one of the important negative aspects of the pyrethrum misting systems. I have no suggestion on how to neutralize the toxic chemical other than get the system shut down. I don’t accept pyrethrum as a safe organic product at all, and I have personally tried all the true organic ingredient substitutions. The end result is that I removed my system. Most of the systems use synthetic pyrethroids or natural pyrethrum (pyrethrins). Both are toxic and I strongly oppose the use of both. These products are toxic to birds, frogs, lizards, cats, dogs and you. Yes, pyrethrum is natural - so are arsenic, hemlock and ricin. Garlic, (dry and liquid) as explained in a past newsletter (see archives), works better and is non-toxic. If people are still trying to push these unacceptable products on you, here's some new research and information that might help you make the right choice. The common diseases affecting the public’s health are too well-known in the 21st century: asthma, autism and learning disabilities, birth defects and reproductive dysfunction, diabetes, Parkinson’s and Alzheimer’s diseases, and several types of cancer. Their connection to pesticide exposure continues to strengthen despite efforts to restrict individual chemical exposure, or mitigate chemical risks, using risk assessment-based policy. The Pesticide-Induced Diseases Database, launched by Beyond Pesticides, facilitates access to epidemiologic and laboratory studies based on real world exposure scenarios that link public health effects to pesticides. The scientific literature documents elevated rates of chronic diseases among people exposed to pesticides, with increasing numbers of studies associated with both specific illnesses and a range of illnesses. If you have any questions about this newsletter or any other topic, join me on Sunday 8am - 11am Central Time for my Dirt Doctor Radio Show and visit on Facebook.